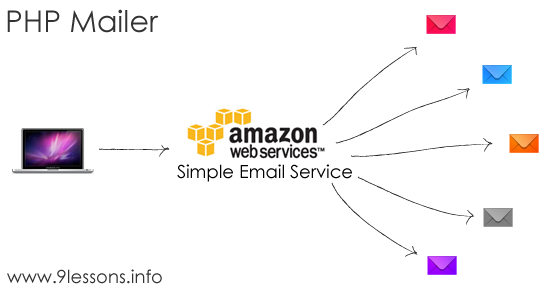 Amazon Simple Email Service SMTP using PHP Mailer. I have been working with labs.9lessons application hosted at Amazon Web Services. Few days back I had enabled email notification system using Amazon Simple Email Service SMTP implemented with PHP Mailer class, I hope the following tutorial will help you to enable email notification system for your web projects. The tutorial contains five PHP files in that three are PHPmailer files other SMTP config files. Here you have to give Amazom SES SMTP credentials. Here called Send_Mail function and passing to, subject and body values. You have to modify following line in above Send_Mail.php code, gmail allow per day only 250 mail limit. it been long you update blog? last time i using your facebook script for my tin tuc news website.. and it work perfect ..
for this email script .. is there any limitation of volume we can sent email out ? I used this as an function so i could dynamically use it in my other pages. I can always give an example of how i did that if people want. Great post once again Sri. Keep up the good work! I have created an account with amazon ses and taken the smtp credentials. how to fix this and where can I see the error logs? I am using this script on normal web hosting its working. same script i am using on my VPS its not working. may i know anything i need to do for this script in my vps?? What's the windows live smtp? Everyone collaborated well. Hats off to all. This is great! Would it be easy to collect reports analytics (opened, clicked, unopened) from mails that send? Hello, for this work for 1-1 mail, but how would it be in order to send bulk mails? Okay, that's the SMTP route. How does one do it the REST-ful API route? what is the name of database ? Ajax Image Upload without Refreshing Page using Jquery. Auto Load and Refresh Div every 10 Seconds with jQuery. Create a RESTful Services API in PHP. Pagination with jQuery, MySQL and PHP. Pagination with Jquery, PHP , Ajax and MySQL.